L’Art de lire combines beginning conversational French with an introduction to French phonics, enabling children to read simple stories in French from the first lesson. Includes verb conjugations, grammar, and conversational French. The six levels of L’Art de lire correspond roughly to the curriculum guidelines for Grades 4-8 Core French in Ontario, Canada. At each level, there is an 80 page Student Workbook with phonics-based stories, a French-English glossary, easy to understand explanations of new grammar concepts, and exercises. The mp3 Audio Files walk the student through the workbook, giving opportunity to hear and repeat all the vocabulary and sentences. Also included are Unit Tests, Flashcards which can be hole-punched and be strung on a metal ring, and a Teacher Workbook, which is a copy of the student workbook with answers filled in. Levels may be purchased separately at the Nallenart Shop. Or order the hardcopy version. Shipping and handling extra. All prices are in Canadian dollars. Customers outside of Canada, please use the Currency Converter Widget for the current exchange rate. Rates may change at any time. You will be charged at the rate determined by your payment processor at the time of purchase. Have you already purchased this product through the French Curriculum Club? Download here. 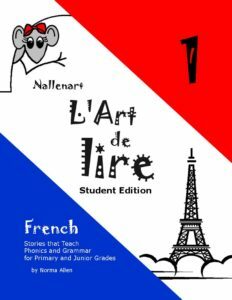 This entry was posted in 2-Lire > gr 3-8, Curriculum and tagged conversation, curriculum, flashcards, French, grammar, language, learn, lesson, Nallenart, plan, stories, teach, vocabulary, workbook on April 6, 2011 by Norma Allen. Are your materials only available in downloadable form, or do you sell hard copies as well? You will need to use the drop down menu to specify the level(s) that you are ordering. Please allow 3-6 weeks for delivery. It doesn’t always take that long, but sometimes I need to reorder CD’s, etc., and that can take some time. Why don’t you include detailed French lesson plans?